← The ICEA hosted a group of Ukrainian legal professionals who participated in a program during December 12-19, 2016 in Miami, Florida. Vlad Zaiets worked for ICEA as a program coordinator in Chicago and client support assistant during short-term programs for international visitors during last 4 years. 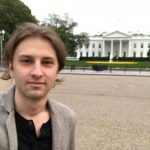 After completing his Bachelor’s degree in Columbia College Chicago in August 2017, Vlad has moved to Washington D.C. where he focuses on expanding cultural and educational ties between the United States and Ukraine. Currently, Vlad Zaiets is the ICEA program manager and he is determined to contribute to a growing relationship between the U.S. and Ukraine, and expanding the cultural dialogue.